Who Should You Choose as Your Realtor? There are many considerations to take into account when selecting a realtor. Preparing a list of questions for your future realtor and interview more than one. There are many reasons why you would want to select a realtor. 1. Experience: One of the first and most important considerations is the experience of the realtor. Ask about how many years of experience the agent has, and also ask about the number of transactions the agent has completed. Also, I would recommend verifying the Real Estate agent’s license, and it is very simple to do on the Business License Look Up. Simply put in the person’s last name and first name and their license number will come up – along with the year they were licensed, and it will provide you with the year they were licensed, the name of the company their licensed is with, and any disciplinary action. 2. Communication: Establish right from the beginning how the communication will be between the seller and agent. Here at Chapman Real Estate, we provide feedback on showings, and do ask every agent for feedback. Even if we do not receive feedback, we still let the seller know that. Weekly communication at a minimum is important. Feedback is important for a seller to know and understand how their home is being perceived. 3. Marketing Presence: Ask about internet marketing and of course print marketing. Will the agent prepare a glossy flyer for your home to provide to buyers when they walk in the door? Will their be mailings to the local neighbors to let them know about a new home for sale? Internet market is also key, ask the agent what sites they advertise on, keep in mind the sites that you look at when selling a home, and ask if the agent advertises on those sites. How often do they post on social media? Do they have social media accounts and if so, which ones? Chapman Real Estate makes it important to market your home on every level! 4. Pricing Your Home: Is the agent pricing your home in accordance with current market conditions. Consider recent comparable sales in the neighborhood and price within the range for a competitive and quick sale. The longer a home sits on the market, the less it will yield from original list price. If there are certain features that make your home stand out, be sure to include that information, and explain why these features add value to the price. 5. References or Testimonials: Don’t be afraid to ask for references or testimonials. It is important unbelievably important! You want someone who is going to be professional and guide you through one of the biggest transactions you will ever make! Ask for a list, and then make dial those numbers or grab an email! If they are hesitant to offer you references, then maybe they aren’t the right realtor for you. 6. Local Expert: Is the agent you are considering to represent you and/or your home, a local expert? Do they live in the area, do they have knowledge of the area? You want an agent who can speak to potential buyers or even other agents about the area, events, community and schools. How long have they lived in your area? If you are looking in the greater Spokane area, then our team is the team for you! 7. 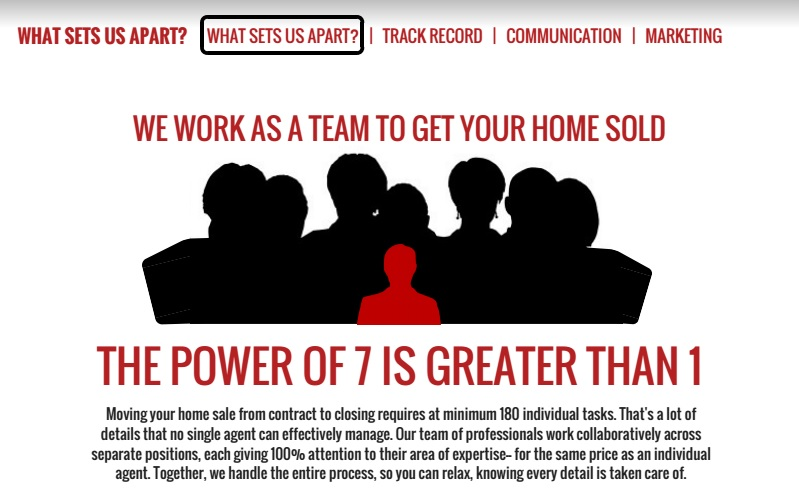 Follow Up: Does your realty team follow up with you? You want to have excellent communication with a realtor before, during and after the sale of your property.